Leaders Gżira United maintained their unbeaten record in the BOV Premier League thanks to a narrow win over bottom-placed Senglea Athletic despite playing in ten men for almost the whole duration of the game. Less than four minutes had passed when referee Stefan Pace had to show Andrew Cohen the red card for hitting Federico Salvati after being provoked by the Senglea captain. 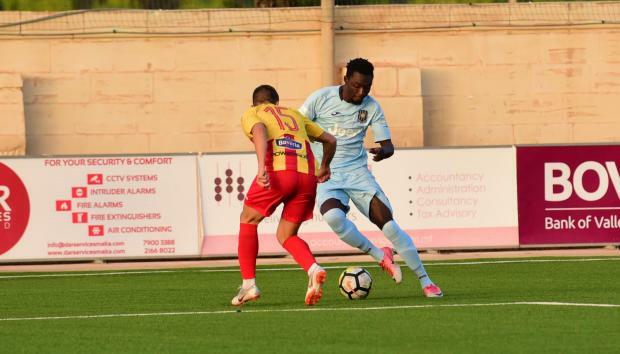 The Maroons still held the initiative in the early stages, however in a swift counter-attack on the 11th minute, Senglea went close as Romani Tcanturia served Augusto Rene Caseres on the right but the latter hit high. Senglea gained confidence and Matias Garcia went close a few minutes later with a powerful shot from the left which was neutralised by Justin Haber. Vincenzo Potenza’s side were now in the driving seat although the Gżira rear-guard kept their opponents at bay. Just before half-time, Amadou Samb tried to serve Haruna Garba from the right but the ball was deflected into a corner by Matthew Farrugia. Gżira took the lead on 51 minutes. It was a personal effort by Samb who entered the penalty area from the right and pulled to a more central position before beating Farrugia with a rising shot. In the remaining minutes, the Gżira rear-guard kept their opponents under control without particular difficulty to take home the three points. St. Andrews made it two wins in a row as they defeated Qormi 2-0 to move a more comfortable mid-table position. St. Andrews managed to take the lead on the 23rd minute when off a Joseph Farrugia freekick, Adrian Borg flicked the ball home past goalkeeper Jamie Azzopardi. Kevaughn Atkinson was not to be denied five minutes from time. The Saints were awarded a penalty after goalkeeper Jamie Azzopardi brought substitute Aidan Friggieri down inside the area and from the penalty spot, Atkinson hit hard past the Qormi custodian to double the score.